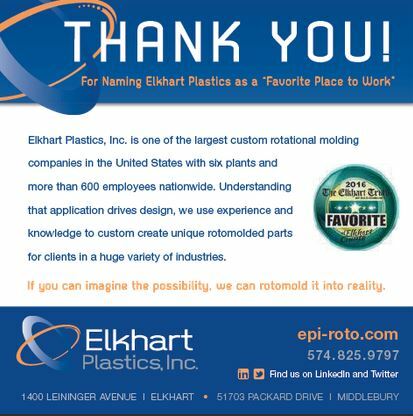 ELKHART, IN – Elkhart Plastics, Inc. is proud to have been voted as a “Favorite Place to Work” by readers of The Elkhart Truth, our team members, friends, and supporters! “We are honored to be so highly thought of,” said Jack Welter, Elkhart Plastics’ CEO. “In addition to those who voted, we would like to thank our team members for being so committed individually and as a group to fostering an inviting atmosphere built on hard work and shared success. “Elkhart Plastics really is a great place to work. We are glad the community agrees! Thank you for voting for Elkhart Plastics!